This is an exchange between Mr Ted and myself homing in on the nature of the thought process. I am going to ignore the OPL because MrT’s essays do tend to be verbese. It’s not glare, it’s just the way he thinks. We’re herding cats here. 1. We can imagine dynamics to be one-sided and male (with space as a non-participant) in which case the individual is deemed fully responsible for the results of his actions which ‘play out in time’. This ‘male’ view of dynamics is impossible in ‘reality’ but it is employed extensively in Western thinking. We use it to establish ‘credit’ and ‘blame’ for emergent ‘results’. This is the legacy of Aristotelian notion of ‘purpose’ (‘intrinsic final cause’) as in the ‘acorn-to-oak-tree’ dynamic where we conceive of the encoded knowledge and purpose encapsulated within the acorn, pushing out of itself (self-actualizing) to produce its final form in such a manner that it is deemed fully and solely responsible for this result. This simplistic (“not that which is most true but that which is most easy”) view of dynamics is used as the foundation for ‘genetics’ and for ‘Darwin’s theory’ and dominates in western architecture/design of organization (government and commercial enterprise)..
2. We can imagine dynamics to be two-sided and androgynous (with space as a non-participant) so that there will always be ambiguity as to the respective ‘male’ and ‘female’ combination; i.e. the dynamic is assumed to be one dynamic of an androgynous character. This understanding we use when we observe a tree moving in the wind or a flag flapping in the breeze. There is no ‘time’ separation in this view, between the re-forming of the tree-boughs and the re-forming of the airflow, since the one is simultaneously reciprocal to the other. This leads us to complexify our understanding of dynamics to the point of seeing dynamics as geometric transformation; e.g. if we start with a simple dynamic view where Lulu is leaving work and heading for the party, we have two entities; ‘Lulu’ and ‘the party’ which are converging. But the party is not the same party that Lulu was moving towards when Lulu is included in it, and work is not the same ‘work’ when Lulu has been removed from it. That is, movement of things can also be understood as the transformation of the relational geometry of space where intrusion (male) and accommodation (female) are flip sides of the same coin (the transformation of the geometry of space). This is still ‘one step short’ of including space as a participant in dynamic phenomena. 3. We can understand dynamics in terms wherein space is a participant is characteristic of ‘flow’ as is the worldview in a Heraclitean philosophy; i.e. the male-assertive fountaining-forth is in conjugate relation with the here-receptive-there-resistive accommodating of the fluid medium. There are not ‘two dynamics’ going on in this view, but one dynamic which we can interpret as two. For example, within a community, there is generally a mixture of ‘pushy’ and ‘accommodating people. The pushy ones tend to have an ‘ego’ that gives full credit to themselves for ‘the results’ that ‘they achieve’ and regards their accommodating brethren as ‘weak’ and ‘inferior performers’ as trees that are whipped about by the wind.. This is the ‘social Darwinist’ view that gives zero credit to the female accommodative aspect and sees all results as if they derived from male competition. This is at the origin if the feminist complaint; ‘my grandfather was a famous engineer, my grandmother had no name’. But the big step in ‘complexification’ of our view of dynamics (bringing our understanding closer still to the reality of our experience) is when we ‘let go’ of the notion of the persisting identity of ‘local objects’ and acknowledge that they are transient ‘forms’ that gather in the flow. As Emerson says, all material objects are essentially like the cataract; i.e. there is a persisting form there even though it derives purely from flow. Material objects that gather and are re-gathered in the flow are not only ‘inhabited’ by the dynamic of the flow-medium but are created by it. The flow is a ‘holodynamic’ in which material objects are flow-forms that are continually being gathered and re-gathered. Damn you’re getting good at this. I am reduced to contesting only one word in your summary of 3. I would substitute imagine for understand. Caught you. I caged that cat. The aboriginal Brain Fart! 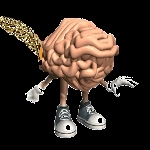 (sorry about the graphic in this link, I couldn’t find a animated brain farting with a feather ) This is the “it is obvious that” which has no place (literally, no neurons) in bottom up/top down thinking (Aristotelean/Taoist Brain Fart.) This leads me to speculate on the bifurcated fart, IE sometime in pre-history The basic imprinting pattern changed from the ABF/TBF pattern which are two minds of the same brain to something different. Fascinating! 1.This is the stupidity you speak of. An idiot has no “me”. No inner voice that whispers “back off” when someone else tries to occupy “rent free space” in their mind. They become zombies, robots, hollow, golems pretending to be wise, clanking around in this meaningless ant warren of a society we inhabit. They are, in fact, without volition. 2. The centered, being pragmatic, understand and accept the ambiguity of the situation, pretending to be idiots, doing what ever it takes to survive but maintaining their individuation, however surreptitiously. 3.Then there are the nexialists, what Maslow called the transcendents. They understand and do not accept the ambiguity of the situation, and they’re going to do something about it. Their minds have not been hijacked. This “difference” I attribute entirely to my having data you are not privy to IE we have two cognitive minds. Overall, very, very impressive analysis, a sidereal view of the ABF/TBF brainfart. Far superior to Plato. This entry was posted on June 17, 2010 at 7:13 am and is filed under The Minds with tags brain, cognition, constructionist, constructivist, counsiousness, duality, logic, mind, perception, reductionist, thought, yin yang. You can follow any responses to this entry through the RSS 2.0 feed. You can leave a response, or trackback from your own site.